(Okayama, 15 March) Researchers at Okayama University report in PLOS Genetics which genes from the yeast genome exhibit dosage compensation — the ability to temper protein production when the corresponding encoding gene’s copy number increases. In addition, they identify the underlying process to be protein degradation, and link the mechanism to stoichiometric buffering of protein complex subunits. Cells are exposed to environmental influences that can affect their biological function. Various buffering mechanisms exist for mitigating such influences, ensuring a cell’s robustness. Dosage compensation is one such mechanism: it arises when an increase in gene copy number does not lead to a linear increase in the production of proteins encoded by the gene. A team of researchers lead by Hisao Moriya from Okayama University has now succeeded in identifying genes that exhibit dosage compensation — an important step towards a full understanding of the robustness of cellular systems against environmental fluctuations. The researchers performed experiments on the yeast genome. For 54 genes, they applied a screening method that enabled revealing whether dosage compensation occurs or not; the method is based on monitoring the amount of target protein when increasing the encoding gene copy number. The latter was done by means of a technique called ‘genetic tug of war’. For 5 genes, protein expression per gene copy decreased upon an increase in gene copy number — an indication of dosage compensation. Moriya and colleagues then looked for the mechanism behind dosage compensation: the acceleration of protein degradation (rather than the deceleration of protein synthesis) was found to be the most probable candidate. Such degradation happens via the ubiquitin–proteasome system: the proteasome (a specific protein complex) assists in breaking down proteins tagged with ubiquitin (a small protein molecule acting as a label for degradation). In addition, the researchers found evidence that the translational efficiency of a gene — the capability of producing proteins — is not affected by dosage compensation. Finally, the scientists made the important observation that dosage compensation predominantly happens for genes that encode subunits of multi-protein complexes. Consequently, the phenomenon may be important for maintaining subunit stoichiometry balance (the quantitative relationships between the amounts of subunits). Perturbations of stoichiometries result in changes in the levels of protein complexes, which in turn have an impact on the biological processes that the complexes are involved in. As Moriya and colleagues point out: “studies of mechanisms behind stoichiometry maintenance might be important for understanding diseases related to gene copy number alterations”. Developed in the group of Hisao Moriya at Okayama University, the ‘genetic tug of war (gTOW)’ screening method enables estimating the over-expression limit of a particular protein. The method consists of first implanting the gene encoding the protein in yeast (Saccharomyces cerevisiae) cells, then generating copies of the gene and, finally, determining the copy-number limit; the latter serves as a proxy for the protein’s expression limit. In the present study, the researchers used the gTOW technique for counting (rather than determining the upper limit of) the copy numbers of the 54 yeast genes studied. Multi-protein complexes (also known simply as protein complexes) are groups of polypeptide chains — the backbones of proteins — bound together into supramolecular structures. Acting as molecular machines, protein complexes fulfill key roles in biological processes. The structure of a protein complex can be seen as consisting of subunits. The research of Moriya and colleagues provides valuable insights into the stoichiometry balance of the subunits required for the actual formation of protein complexes. Specifically, the researchers found that of the various subunits occurring across the protein complexes investigated, 70% (12 out of 17 subunits tested) display dosage compensation. Therefore, dosage compensation may be crucial for subunit stoichiometry maintenance, as perturbations of stoichiometries lead to changes in the levels of protein complexes. Koji Ishikawa, Koji Makanae, Shintaro Iwasaki, Nicholas T. Ingolia & Hisao Moriya. Post-Translational Dosage Compensation Buffers Genetic Perturbations to Stoichiometry of Protein Complexes. PLOS Genetics, January 25, 2017.
e-Bulletin Vol.3 (2013)：Measuring the copy number limits of all genes in budding yeast. – First time ever for any organisms –. OU-MRU Vol.36 (2017)：Overloading of protein localization triggers cellular defects. Associate Professor Hisao Moriya, Ph.D.
Schematic of the approach for detecting dosage compensation. 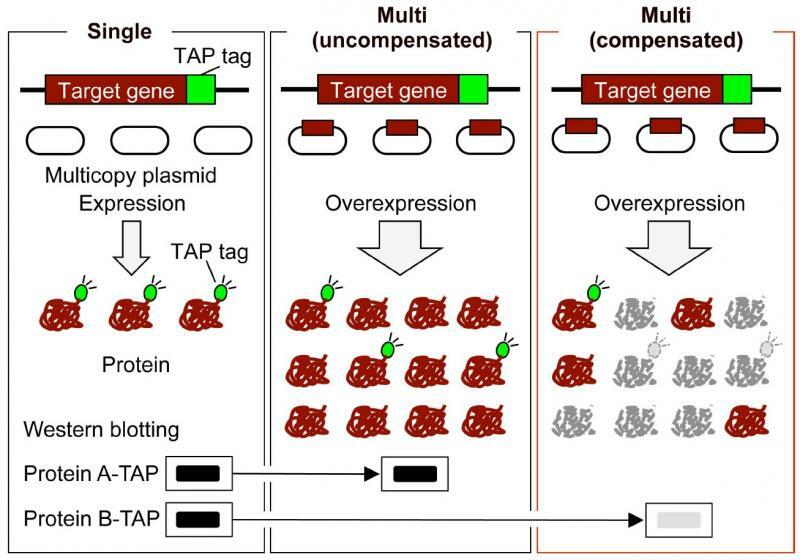 When an increased gene copy number does not lead to a proportional increase of expressed proteins (right panel), dosage compensation has taken place.